Yes, her name was Mary, Mary Livingston, but that was the character's name. 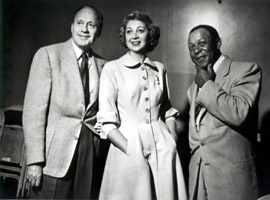 in real life she was Mrs. Jack Benny, and her real name was Sadie Marks. Jack and crew, Dennis, Rochester, and Mary ( I believe her name was) was a great comedy back then. The humor was very dry. Jack always took the brunt of all the jokes. The thing is, Jack never really knew that he was getting the shaft. He played a lousy violin on the show, yet in real life he could play. Jack could just give a look and a pause and it was funny.